This is a beautiful pink super-soft rayon stretch blend 95% rayon, and 5% spandex T which comes in S, M, or L. Small measures: 30-25-32. 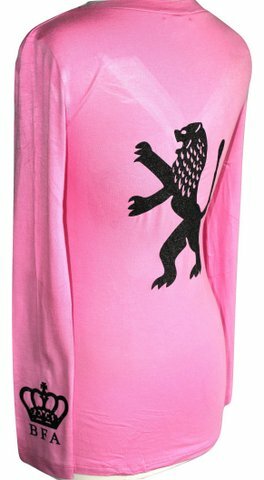 Medium measures: 32-28-34 Large measures: 35-30-36 Ladies size, with Yeshua in modern Hebrew, the Jerusalem Lion on the back of the T, and the BFA Crown on the arm. Designed and Printed in the U.S.A.